Oakland, CA—The World Bank Group has indirectly financed some of Africa’s most notorious land grabs, according to a report by a group of international development watchdogs. The World Bank’s private-sector arm, the International Finance Corporation (IFC), is enabling and profiting from these projects by outsourcing its development funds to the financial sector. 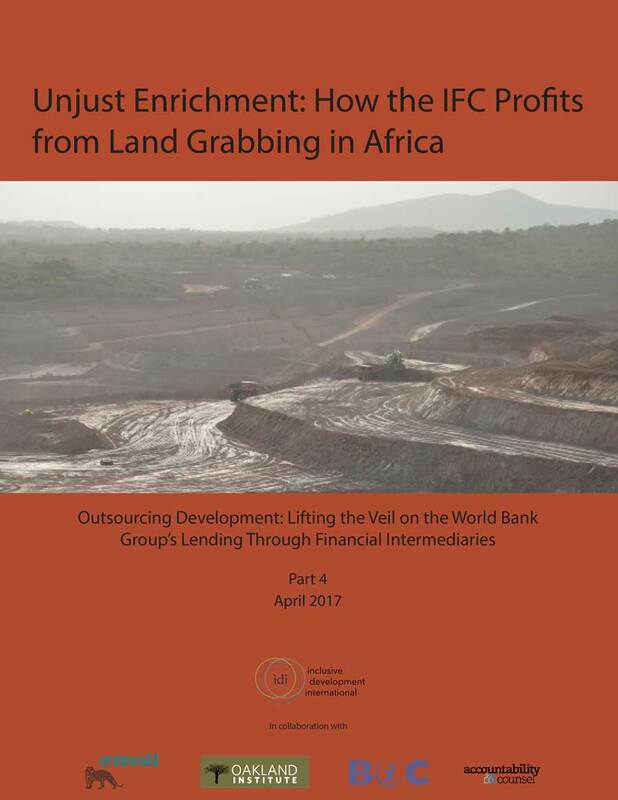 The report, Unjust Enrichment: How the IFC Profits from Land Grabbing in Africa, was released today by Inclusive Development International, Bank Information Center, Accountability Counsel, Urgewald and the Oakland Institute. The report is based on a yearlong investigation conducted by Inclusive Development International, which found that IFC-supported commercial banks and private equity funds have financed projects across the world that have forcibly displaced hundreds of thousands of people and caused widespread deforestation and environmental damage. In Africa, the investigation uncovered 11 projects backed by IFC clients that have transferred approximately 700,000 hectares of land to foreign investors. The projects include agribusiness concessions in the Gambela region of Ethiopia that were cleared of their indigenous inhabitants during a massive forcible population transfer campaign in the area; oil palm plantations in Gabon that have destroyed 19,000 hectares of rainforest and infringed on the customary land rights of local communities; and a gold mine in Guinea that led to the violent forced eviction of 380 families. The report is the fourth of the investigative series Outsourcing Development: Lifting the Veil on the World Bank's Lending Through Financial Intermediaries, which follows the trail of IFC money and examines at how it impacts communities around the world. Inclusive Development International’s yearlong investigation uncovered 134 harmful or risky projects financed by 29 IFC financial-sector clients. These projects are found in 28 countries and on every continent except Antarctica. A database of the findings can be found here. In response to the concerns raised in the Outsourcing Development investigation and by the IFC’s Compliance Advisor Ombudsman, IFC Executive Vice President Philippe Le Houérou recently acknowledged the need for the World Bank Group member to re-examine its work with financial institutions. In a blog post from April 10, Le Houérou wrote that the IFC would make “some important additional improvements to the way we work,” by scaling back the IFC’s high-risk investments in financial institutions, increasing its oversight of financial intermediary clients and bringing more transparency to these investments, among other commitments. The IFC has also exited investments in banks highlighted by the Outsourcing Development investigation, including ICICI and Kotak Mahindra in India and BDO Unibank in the Philippines. Financial-sector lending represents a dramatic shift in how the IFC does business. After decades of lending directly to companies and projects, the World Bank Group member now provides the bulk of its funds to for-profit financial institutions, which invest the money as they see fit, with little apparent oversight. Between 2011 and 2015, the IFC provided $40 billion to financial intermediaries such as commercial banks and private equity funds. Other development finance institutions have followed suit.